I suppose I had hoped to see Laurie Lee sipping a pint there - the Woolpack was his local pub. 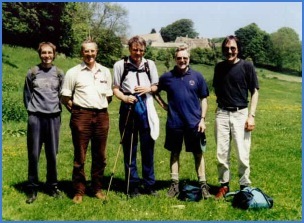 Alas, we were too late for this experience as we did the walk a few weeks after his death. This "Boys" on this trip, which was one of the earliest we had done as a group, consisted of Mick, Larry, Peter, Ray, Spike and myself. Spike is the only one of the group who is older than I am and since this excursion has retired from work, and unfortunately now we don't see him much. However, when I last saw him he looked very fit and he knows I've got this web site so maybe he will read this and be tempted to get in touch for a walk. Spike always likes to start a days walking with a snack. And so on the way down to Stroud, which was to be the starting point of our little walk, we stopped at one of a chain of roadside cafés for coffee and a bite to eat. It was quite pleasant to sit down and discuss the route for the day, but I must admit this "watering hole" noted for its small cooks, we considered to be poor value. Hence in recent years we have generally stopped at supermarkets for a Full English Breakfast, which we can get for the price of a coffee and bun at these other establishments. On reaching Stroud, which I don't think any of us had visited before, a car park was quickly found, and soon we were walking down to the River Frome and the canal and following a path south east that took a course between these two waterways. We had got a route for a walk in this area, which we initially followed and took care on reaching the next bridge, after a blue and white bridge, to leave the "waters". 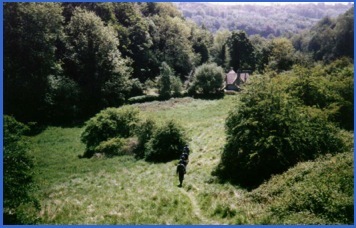 From here we headed generally eastwards along various roads until we reached a steep uphill path called the Rope Walk. I remember this well as I started to lag behind, and, if I remember right, the rest of the "Boys" waited for me at the top. Even then the hills were giving me trouble. 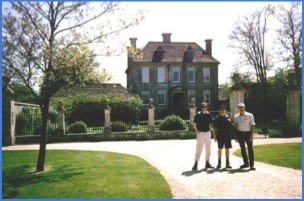 Soon we came to what the Walk Guide described as the exquisite Nether Lypiatt Manor, owned by Prince and Princess Michael of Kent. While we were there a Range Rover went past and we wondered if we had been close to Royalty. However, we couldn't hang about this posh abode all day and consider how the other half live and so it was a quick photo of Larry, Spike and Mick, he's the one with the legs, in front of the Manor and off we went again. where we had lunch. 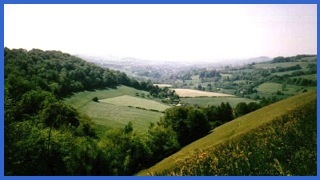 the base of the valley north-eastwards and come out of the valley so we could pass Ferris Court Farm and Fennells Hill Farm on the way to Swift Hill, which is situated, just to the south east of Slad. This we did but having taken a left in Toadsmoor Woods, when we should have gone straight on, it took us a little longer than we had intended and so lunch on Swift's Hill was a little behind schedule. Swift's Hill was a lovely spot. The rolling scenery is quite different to Warwickshire and parts of the Cotswolds nearer home. Here we enjoyed our lunchtime sandwiches taking in the splendour of our elevation as the sun beat down on us. All that was needed to add to its enjoyment was a pint of best English Bitter and with that in mind we continued our trek to Slad going via Knapp Lane and Furners Farm.Downhill towards Slad - next stop is the Woolpack. k to Stroud. Downhill all the way I thought. But Peter had different ideas. He had looked at the map at lunchtime and took us uphill on a path that was the southern boundary of Morgans' Wood. 'Twas uphill, 'twas hot and with the BEB inside us walking was considerably slower than earlier in the day. 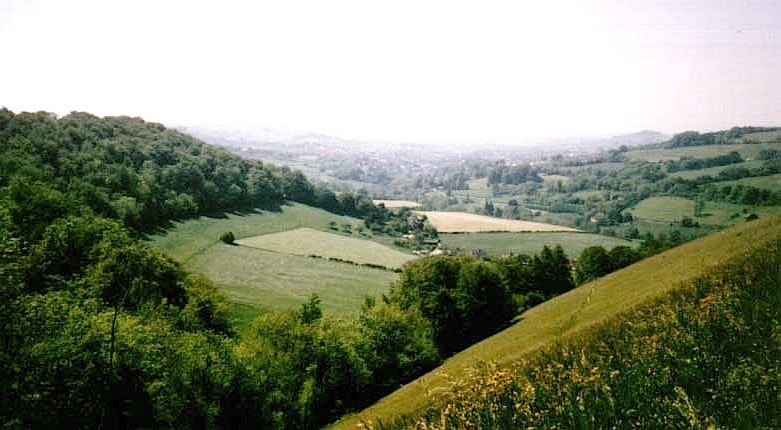 But it was very pleasant and once we had reached Folly Lane it became even more so as our track was now generally downhill into Stroud via the southern edge of Wickeridge Hill and Hawkwood. We keep talking about going that way again some time, but it in many ways was such a perfect day it is unlikely it will be equalled.